At Evanston Regional Hospital, we understand how debilitating a foot or ankle problem can be. Whether the condition is chronic or acute, if your mobility is compromised because of pain, you should find out what kind of relief is available through a Podiatrist. Generally, conservative approaches to improve flexibility and provide pain relief are all a patient needs. If, however, conservative treatment is not effective, advanced surgical repair is available through Evanston Regional. Patients with diabetes are particularly at risk for foot conditions and should take extra care. Consulting with a physician regularly is encouraged for anyone with diabetes. 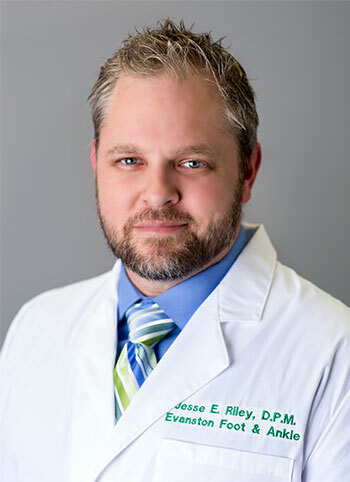 Jesse E. Riley, DPM, provides both medical and surgical care for feet and ankles, specializing in trauma such as complex fractures, rearfoot reconstructions, limb salvage and diabetic wound care. He also treats ingrown toenails, warts, plantar fasciitis, and more.